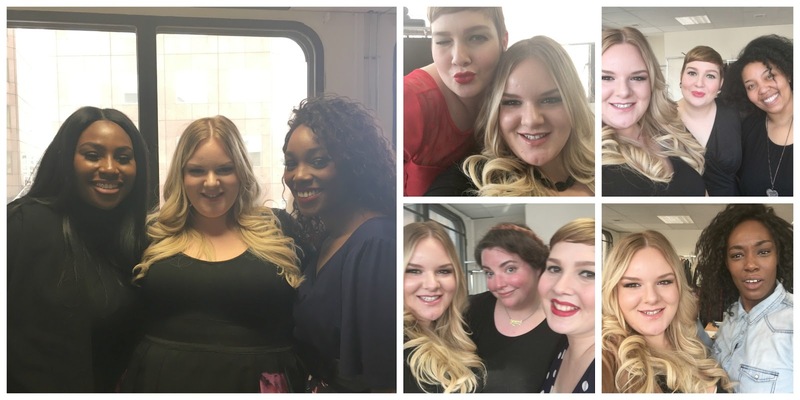 When I started to type this, I was on my way home from a plus size photoshoot with Scarlett & Jo in London; a day that was all about inspiring plus size body confidence, wearing beautiful clothes and making new friends, above everything else. I had my latest playlist on, I was dancing about in my seat, beaming from ear to ear. When I think about Saturday and the electric atmosphere, I am filled with pride and happiness. 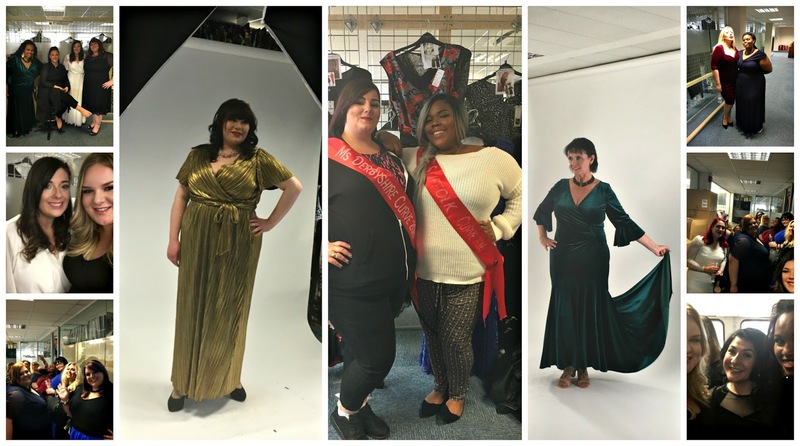 I was at the photoshoot with the other S&J brand ambassadors along with over 100 other plus size women who had entered a competition to become the face of the brand and the petite and tall plus size lines. Many of the beautiful ladies had never been on a photoshoot before and many hadn’t worn a dress or makeup in years. All of the women were between a size 14 and 32 and aged up to 62. I found it incredible to hear their stories, learn of their struggles and their achievements and to hear about why the day was so valuable to them. Often life gets in the way and for many of the ladies, they had been so busy focusing on looking after others for years that they really valued the day as a time for taking a moment out for themselves which is a really powerful thing; great for the mind, body and soul. Although uniquely different, we had all shared many of the same struggles and prejudices that can come with being larger than what is considered to be the desired standard in society. To finally be in a place with so many likeminded women, all supporting one another and building each other up felt comforting and inspiring in equal proportions. The way that women in particular can make other women feel about themselves and their choices is really powerful so to have so much positivity and happiness under one roof is so over whelming and inspiring to me. I’ve worn many Scarlett and Jo dresses in recent years so I can shout from the roof tops about how incredible they are but to try one on for yourself is a different matter entirely. To see the sheer happiness on the faces of many of the ladies who tried on a Scarlett & Jo dress for the first time or in a style that differed to what they would usually wear was fabulous. It was a day that inspired confidence, camaraderie and friendship. An ultimate nod to GIRL POWER! I am very lucky to have been able to meet so many lovely ladies, including some who read my blog. For me, the day was a reminder of one of the reasons as to why I blog and why I’ve dedicated almost 6 years of my life to WhatLauraLoves. I’m a big believer in being the best version of yourself possible, for you and you alone. Loving yourself is an option that anyone of us can pick yet so many choose to hate themselves. Most of us have parts of ourselves that we are self conscious of, things that we like more than others and things that we would like to change if we could but I think its really important to focus on the things that we do love. People often think that I’m really confident in myself and to some extent, I definitely am. However there are things about myself that I’m not so confident about and that have taken me a lot of years to embrace. My stomach has always been an area that I haven’t been 100% confident about and I’m still not but I’m getting there and the vast majority of the time, I don’t let my insecurity get in the way of me living my life. Whenever I feel worried about it, I remember the empowering feeling that I get when I haven’t let it stand in my way and that keeps me going. My tummy is a part of me, I can’t hide it and I love me and my life so I’m sure as hell not going to let anything or anyone elses opinions affect my happiness. Having a large stomach certainly doesn’t define me as a person and the moment I realised that, I became far happier. It is hard, especially doing the job that I do as the rare online troll will make a comment that could really knock my confidence, if I didn’t have both feet on the happy train. The reality is, I couldn’t care less about what other people think about the way I look and I wont hide away for fear of their comments. If I feel happy and confident when I leave the house, thats all that matters. I chose to share these outfit photos alongside this post as they share two different views of my tummy. One where it stands out more than the other. This wasn’t intentional when I took the photos; I’d actually intended for them to be part of a post showing how you could dress the Scarlett and Jo Houndstooth Leggings up or down but I think they illustrate my point perfectly. My tummy is a part of me and I’m going to wear whatever the hell I like as long as I feel comfortable and confident! I love these leggings because the have a fantastic print on them that really makes a black outfit pop. If you love monochrome then they’re a great way to change up your outfit but they would look equally as lush with a bright top. I have these in a size 20 and they’re a big fit. I would usually wear a 22-24 in leggings but these fit perfectly so I’d advise sizing down when ordering leggings from Scarlett and Jo. What I love the most about them, aside from the houndstooth print, is their material as they’re not thin and flimsy and you can’t see through them. They’re very much a legging that you could wear with a shorter top. In the first outfit, I’m wearing the houndstooth leggings* with a black cami and my black belted sleeveless trench jacket which is now ON SALE for only £25; I’d really recommend check it out as it makes a great layering piece for day or night and its an absolute steal for the price. This is a look that I would wear for a night out because its a little more dressed up and with my Chanel WOC, silver earrings to match the silver hardware of the bag and my Jones Bootmaker boots* for a little height, I think this outfit looks well thought out and put together. Perfect for a meal out or drinks with friends. These are the first boots that I’ve tried from Jones Bootmaker and they’re certainly well made and superb quality. I love the design of them as they’re shaped unlike any other ankle boots that I own. The second look shows how I would wear these leggings during the day but in all honesty, I still think that this outfit looks smart and it could easily be worn for dinner out at night. The jumper that I’m wearing is from Yours Clothing and it is HUGE. It does have a slouch fit but this light weight knit is seriously oversized. I’m wearing an 18 here when usually I’d buy a 22 in something like this. I love how long this jumper is and I’ve got so much wear out of it as I can just throw it on over leggings and jeans, either on its own or with a cami underneath. Since its quite thin, it easily fits underneath all of my jackets too. I paired it with my uber comfortable Michael Kors flats and my new bag from BB Bags*. They create the most gorgeous personalised real suede clutch bags; I went for the grey with rose gold lettering and I’m seriously IN LOVE with it! I’ll be reviewing this bag in full later this week but for now, head on over to their facebook page to check out all of the beautiful colour combinations; the options are endless! I can’t decide which outfit I prefer out of the two as I’ve worn both looks so much with these leggings! I can’t wait until the weather gets a bit warmer as I’ll then be styling them with some brights from my wardrobe. To shop the leggings, head direct to the Scarlett & Jo website here and for all of their other beautiful S&J pieces you wanna be checking them out here. How do you take an outfit from day to night? What inspires you to be body confident? I think everyone should feel comfortable and have confidence. Confidence means different things to different people too. I love the range of dresses they're so pretty. Lovely post Laura. You look great. I adore the leggings. I love your confidence and wish I had the same! Those houndstooth leggings are seriously cute and they go perfectly with the shoes you chose! Sounds like a great event and everyone looks great. I love the houndstooth leggings too! All your outfits really suit you, so nice that you could do the photo shoot. What an amazing post, I love how confidence you're and also loving the second style I think it looks awesome on you.